If you think kurtis are passed, we’ll get you to change that perception soon. Yes, it’s time for kurtis with leggings to make a graceful exit. But kurtis, tunics, and kurta sets will forever be faves for the desi girl in us. There are some kurtis that you still need to customise and get stitched. For all those and more, here are some of the most sought-after Boat Neck Kurti designs to boost up your looks. Which Neckline Should You Be Wearing According to Your Body Figure? Kurtis are a huge part of one's closet as they can be worn in any occasion. Depending on the style of the kurti, the material it is made with, and the bottoms it is paired with, it can be either worn for a casual day-out or for a wedding. In the process of buying a kurti for any occasion, neckline is one of the first things which is considered. A neckline can make the kurti look very sleek and also make the kurti look dull and bad. Therefore, neckline for a kurti must be chosen with great care. Boat neck is one of the necklines which is in-trend right now. Also called as Sabrina neck or boat neck, this type of neckline is wide across the shoulders and short in length. It shows the collar-bone of the person wearing it. It is very popular in the west and the exploration of its usage has just begun in the east. Boat neck kurtis serve the purpose of drawing attention to the neck, thereby drawing attention away from the bust. This neckline, though best suitable for petite women, plays a crucial role in balancing the body regardless of your body type. It screams elegance like no other neckline. It is a good choice for kurtis as it is classy, comfortable and figure enhancing. V neckline creates an illusion of length and therefore, it is suitable for all body types. The best part about the V-neckline is that it can be as long and revealing or as short and concealing as we want. It draws attention to the face and enhances the neck. Women of all body types can choose to wear this neckline as it flatters all the body types. A sweetheart neckline, just like the name suggests, forms a heart shape over the bust. This neckline is best suited for women with heavier busts as it accentuates their cleavage while also providing decent coverage. This neckline also makes anybody look proportional. Petite women and women with an angular face can achieve a curvier look when they wear this neckline. Square necklines are perfect if you want to show-off your collarbones. It makes a woman appear tall and lean. If you have a short neck and a round face, square neckline works wonders for you as it takes off the roundness of your face and also makes your neck look longer. For pear-shaped women, this neckline balances their body out as it makes the shoulders appear wider. Boat necks, which are so in-trend right now, are an amazing choice for a neckline. For women with wider hips (Pear shaped), it helps in drawing attention away from the hip-area while also making the hips look narrow. For petite women, it makes the shoulders appear broader and also accentuates the bust. This neckline also makes a great choice for women with a long face as it balances out the length with the illusion of width it creates. If you like to wear something which has multiple colours but you also don't like much bling, this kurti is just for you! 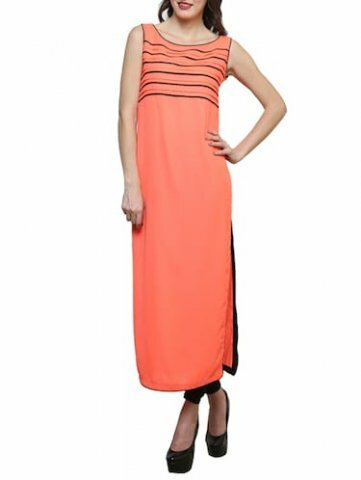 It is a simple, elegant kurti with boat neck and what adds to its elegance is the orange yolk. It has a blue colour strip at the bottom. With grey as the base, it has golden polka dots all over the kurti. This 100% man-made fibre kurti has 3/4th sleeves and it is a good choice for any day. You can buy this kurti at Rs. 959 from W for Woman. Chevron pattern has truly made a comeback this season. This pattern is extensively being used everywhere, right from home interiors to clothing. The thread detailing near the boat neckline and the chevron pattern gives the kurti a trendy yet classy look. The colours in the kurti - green and cream, gives an impression of sobriety. Being 100% cambric cotton, this is airy and light. Pair this kurti with a light coloured palazzo and you are ready to rock the office-look. You can buy this kurti from Ajio at Rs. 1,499. Asymmetric patterns are a rage now and it is very common to see kurtis breaking the even-ness. This kurti does just that. This A-line kurti has black and grey colours and is made of Chanderi cotton fabric. At mid-calf length, this kurti balances any figure type. The 3/4th sleeves attached also help in the purpose. To best describe this kurti, we can come up with only two words - casual and elegant. Isn't this the perfect combination everyone is looking for? The layer in the front adds detail to this otherwise plain kurti and gives it the much-needed pop. 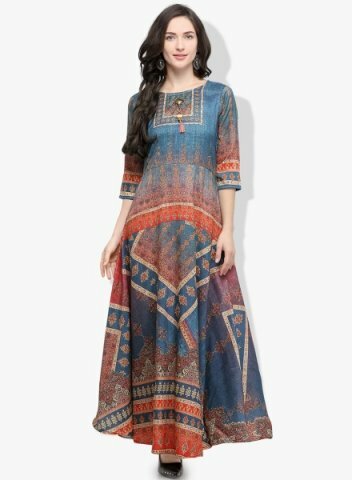 You can buy this printed kurti which is a part of the Soch creations from Myntra at Rs. 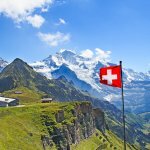 2,998. This kurti caters to the needs of modern women and we had to bring it to you. 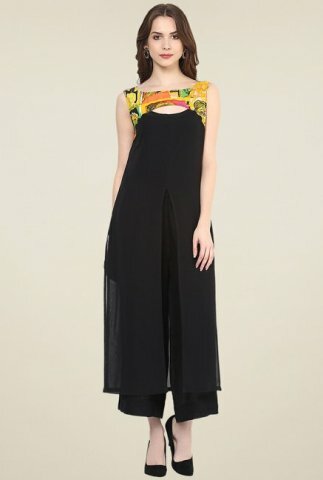 This black kurti from Pannkh has a boat neck and no sleeves. It is made out of the softest crepe fabric and has a slit in the front. This straight black kurti isn't just a plain old black one. What makes it so interesting is the very beautiful yoke. The multicolour yoke breaks the monotone of the kurti and gives it a splash of colour. Another interesting detail is the slit near the neck. It is best paired with palazzos. You can add this beautiful kurti to your wardrobe by buying it from Tatacliq for Rs. 719. For the people who want to look stylish with a budget, this kurti is a must buy. Retailing for just Rs. 399, this kurti is a great addition to your wardrobe. The blue colour in the kurti makes it a perfect contrast to the white panel in the front. 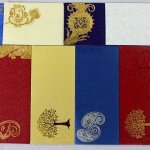 With block print scattered all across the white panel along with the Sanskrit verses, it gives a trendy and chic look. The cute buttons on the front and the sleeve detail makes it a perfect choice for any day-out. The fabric is also a cotton blend and you can purchase this from Max. Georgette kurtis are trendy and they are the best choice of kurtis for any woman as it hugs the figure. It also gives the illusion of softness and feminity to the person wearing it. Black georgette kurtis are a must-have in your wardrobe and so, we decided to help you with the choice. This black georgette kurti from Ahalyaa has a boat neck and half sleeves. It has a lovely golden print all over the fabric. From far, it looks as though the fabric is filled with rhombuses. Only when attention is paid to the fabric, we find that there is much more to it than the plain looking rhombuses. It also has additional gold detailing at the bottom and the sleeve of the kurti. It is best paired with a black legging or a black skirt. You can make this gorgeous kurti yours by purchasing it from Amazon for Rs. 634. Kurtis made out of checkered fabric are what you see whenever you turn your head. We thought that you must own one too! So, we bought this beautifully checkered kurti to you. This blue kurti is plain all over and what makes it special is the attached cape. The cape has a digital checkered print and it covers the hands till the elbows. There are no sleeves attached but this cape solves the purpose. The kurti is calf-length and has a flare at the bottom. It is a perfect choice for a party or a day out with friends. Buy this Ziyaa kurti for Rs. 641 from Flipkart. While until a few years ago, much attention was paid to the detailing on the kurtis. Now, however, solid colour kurtis have become very common. They give off a sophisticated vibe and can be worn on any occasion. We bring to you a solid orange colour kurti. This georgette kurti, at 46 inches, is quite long and has a straight cut. The best part about this kurti is the pattern it has in the yoke region. There are no sleeves to this kurti and it is best for people who want to show off their arms. Others, however, can always pair it up with a black shrug. This kurti works well with both a black legging or jeans. Complete your ensemble with high heels to appear chic. The keyhole detailing in the back makes the outfit look trendier. 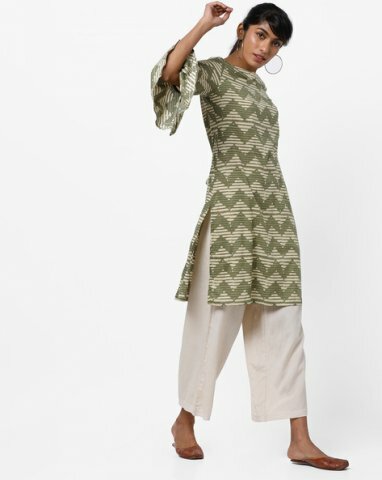 You can buy this Zotw kurti exclusively from Lime Road for Rs. 828. Pastel colours are in-trend right now. No matter which outfit you choose to buy, there are a lot of options with pastel colours. Peach, however, is a lovely and soft colour which adds a feminine touch to the person wearing it. The longer the length of the kurti, the better it looks - this is what is being followed by the fashionistas these days. Printed soft A-line kurtis are what is in-trend right now. Enhance yourself with this A-line printed kurti from Stylee Lifestyle. Made with the softest art silk fabric, this kurti has 3/4th sleeves. The detailing on the yoke along with the tassel makes this kurti all the more appealing. With blue as the base, this kurti has multiple colors like orange and cream which bring the pop back into the kurti. 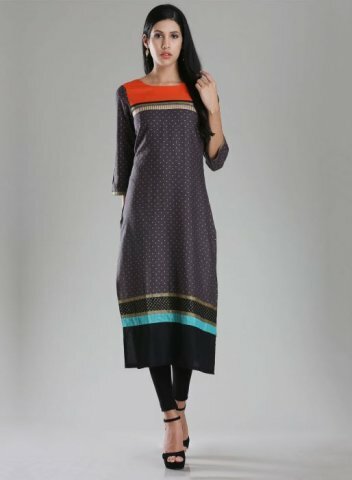 The pattern is unique and you can purchase this kurti for Rs. 2,919 from Jabong. With each kurti being made differently from the other, it is essential that we have an understanding of how to pair a kurti with a bottom. The major part of our focus is on selecting a colour which complements the colour of the kurti. Once we settle on the colour, we don't pay much attention to the type of bottoms we pair with the kurti. The colour of the bottoms is indeed important. However, another thing of equal importance is the length of the kurti. If the kurti ends at hip-length, skinny jeans is its best friend. However, if the length of the kurti is between the hip and the mid-thigh region, a patiala will ensure that the kurti is enhanced to the maximum. Skinny jeans, leggings, skirts and palazzos are best paired with kurtis whose length is between the knee and the ankle. Not too deep, this neckline ends just at your collarbone and looks simply breathtaking. If the neckline is already embellished opt for big earrings but, if the neckline is simple, go for a stylish choker. Long beaded necklaces look terrific with boat neck outfits, be it ethnic or western. 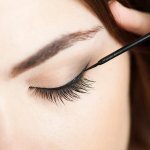 These can be multi-stranded, or single-stranded. These give the outfit the necessary poise and glamour. Boat neck kurtis looks good on women having Petite figure. Vertical hemline will be the ultimate things on kurtis which will go well to showcase your curves. Wear this type of kurtis with parallel pants or embroidered salwars. Avoid pleated or too many loose salwars such as Patiala salwars or harem pants. These will make you look shorter and plumpy.